(KIA-POW-EVD) - 22 February 1944, Mission #111, to Aschersleben, Germany in B-17F #42-5788 Pluto's Avenger (360th BS) PU-H. B-17 was hit by German fighters. It had peeled off under control in a shallow dive. The #4 engine was smoking. It crashed near Duffel, 15 km SW of Antwerp, Belgium. 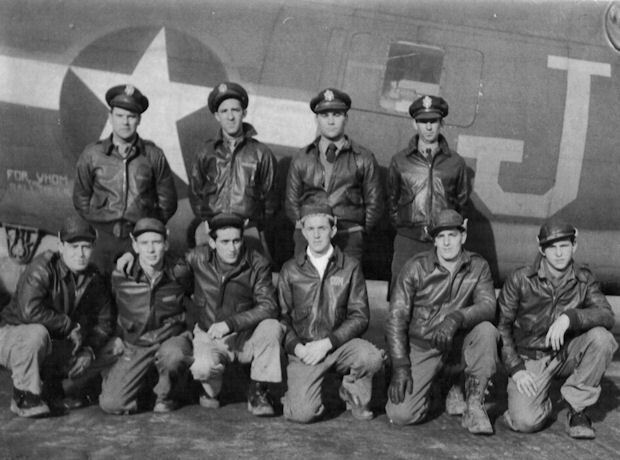 The regular Morrin Crewmen were flying on their 4th credited combat mission with the first mission on 3 February 1944. Flying as an observer with the Morrin Crew was Major George R. Weinbrenner who managed to evade capture and eventually made his way back to England. Major Weinbrenner was from USAF Headquarters in London and was working on a top secret project to develop rockets that were to be fired upwards from formations in an attempt to shoot down enemy aircraft that were flying above 8th Air Force formations and dropping bombs to hit formation bombers. Sgt Charles G. Dodge, Jr. was captured by German S/S troops. He was wounded during interrogation by the S/S and survived the war. He was not processed through normal German POW procedures and camps and did forced labor on a German farm until liberated. Crew Note: T/Sgt Frederick J. Cataldi died on 25 March 1944 while a POW, in St. Giles Hospital, Brussels, Belgium. He was suffering from severe flak wounds on his left body side. Frans Jacobs told this story. It was translated and edited by Dirk, his only son. February 22nd 1944 was a cold yet sunny day. 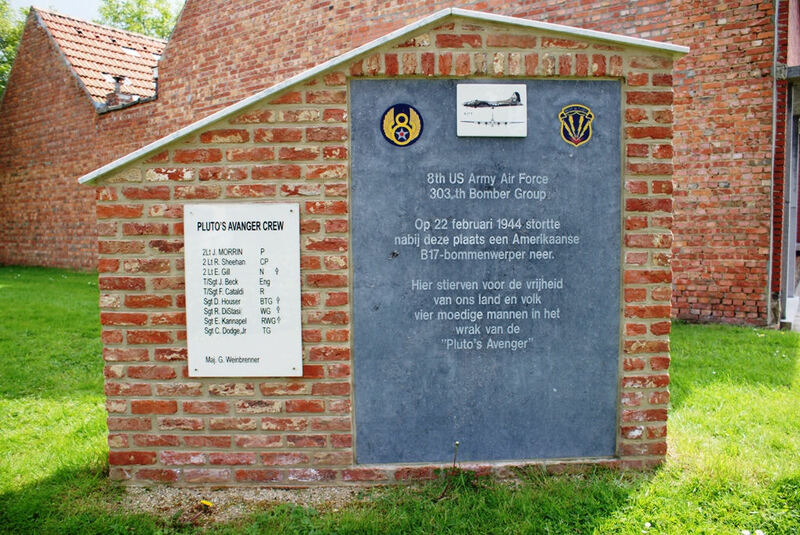 People in Duffel, a countryside village in Belgium, clearly heard a big airplane descending rapidly. 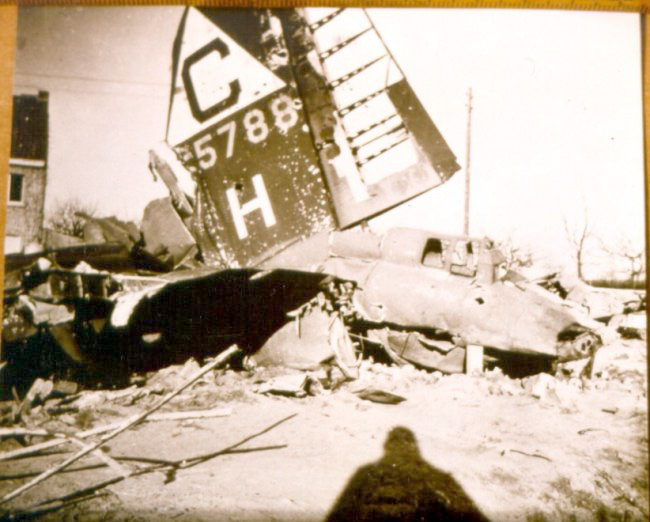 Only four crewmembers managed to parachute out of the B17 that was shot down. Apparently the pilot tried to land the plane on an open meadow but ended up on some glasshouses, very close to the residential building. As the plane had caught fire, people were frightened that the house would go up in flames as well. Eventually, that didn't happen. What did happen was that German occupation troops put up sentries around the wreck really fast. However, not fast enough to stop some villagers from gathering some souvenirs from the plane. At least one of the crewmembers that parachuted out landed safely, some 5km away from the crash site. George Weinbrenner got rid of his parachute and bomber jacket and waited for the sun to set. He walked to the neighboring village Sint-Katelijne-Waver and prayed on the church steps that he�d find safety. He walked over to the nearest house where he could still hear people talking. This was the house of the Jacobs family, father, mother and six children. George went round the back, opened the kitchen door and proceeded right into the living room saying �American parachutist,� pointing at his sleeve insignia. Remy Jacobs had learned to speak English in WWI, a veteran having served together with English, Scottish and Irish troops. As such he was able to have a conversation with George and learn what had happened. All the children were sent to bed immediately. Remy went to the village priest, of whom was known that he was tied in with the resistance movement. The priest told them where to go. Remy picked up George and took him to the resistance people, where he was sheltered and given other clothes. This couple of days was very exciting, as the German soldiers were actively looking for the escaped crewmember. Frans Jacobs, Remy�s youngest son (5), remembers clearly how they were all told repeatedly not to tell anything to anyone. Remy didn't dare keeping his children out of school, as this would have aroused suspicion as well. The resistance (or �Secret Army�) provided George with a passport and put him on a train to Brussels, where he was met by other members who took him to the French border. George lived with a French farmer for awhile until the people of the �escape route� contacted him. He was taken to the Pyrenees Mountains and into Spain from where he was shipped back to England. After the war a message was sent that George had made it back unharmed and a US Army jeep passed by the Jacobs house to drop off food and clothing as a token of gratitude. Frans still has vivid memories how the soldiers put him in the jeep and drove him around the town square. Later on, both US and English formal certifications of gratitude were delivered. Remy passed away in 1956. 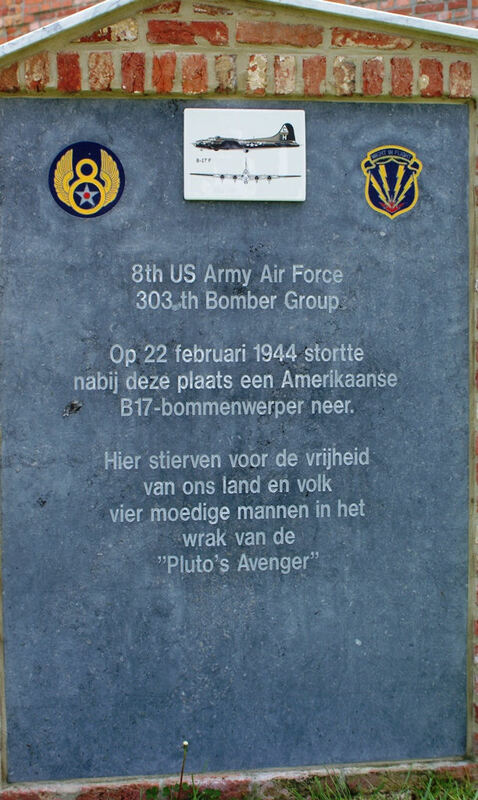 The memorial is located near the crossing of the Rechstraat with the Veleplas and commemorate the fallen crew members of the American B-17 "Pluto's Avenger" bomber which crashed on February 22 1944 near Duffel. Here died for our freedom four brave men in the wreckage of the "Pluto's Avenger."